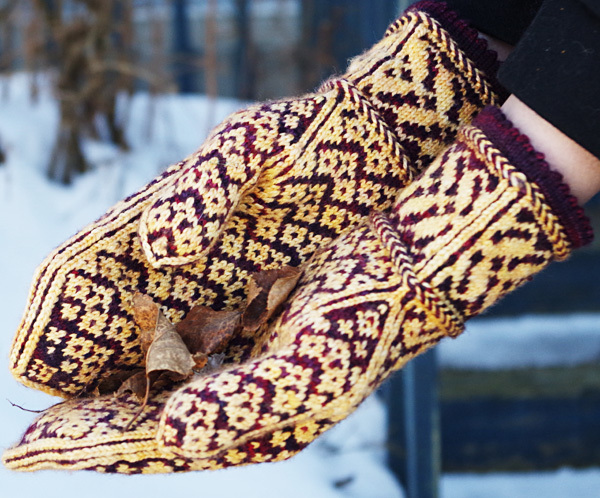 I designed these mittens for a special person in my entourage that has a heart of gold, the most warmhearted person I know. We all have one of those in our lives, the type that volunteers for everything and never asks for anything in return. I wanted to make some mittens with hearts all over them to show her how much I love and appreciate her. 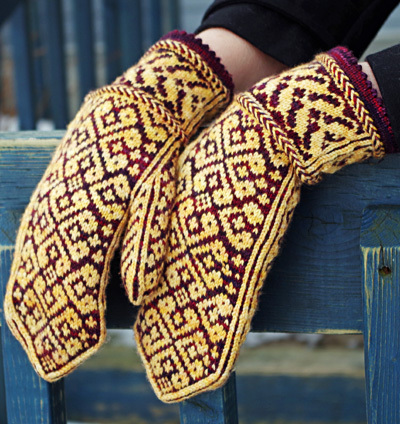 Since I learned a lot of my Fair Isle knitting on the internet, the styles of the hearts on the mittens are quite eclectic. 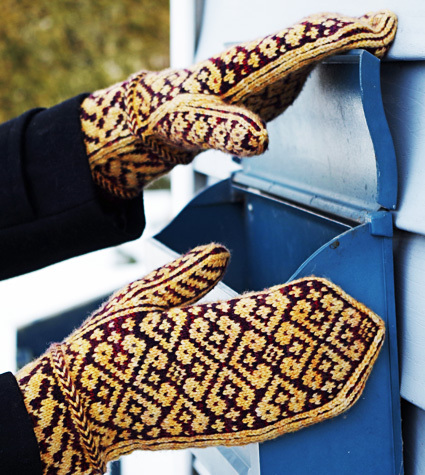 hands during cold winter days. 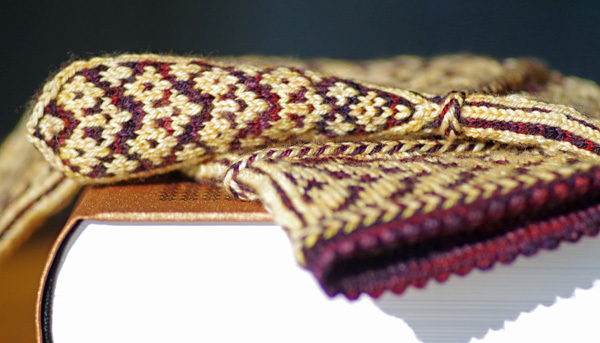 A handy tutorial on how to knit a Picot edging can be found here. Designer's Tip for working the hem: Using the Turkish CO, CO over two circular needles (best if different types of colors). Make the appropriate number of loops from back to front and join to work in the round. Work the cuff only on the top needle leaving the other one unused (dangling) until it's time to fold over for the picot hem. 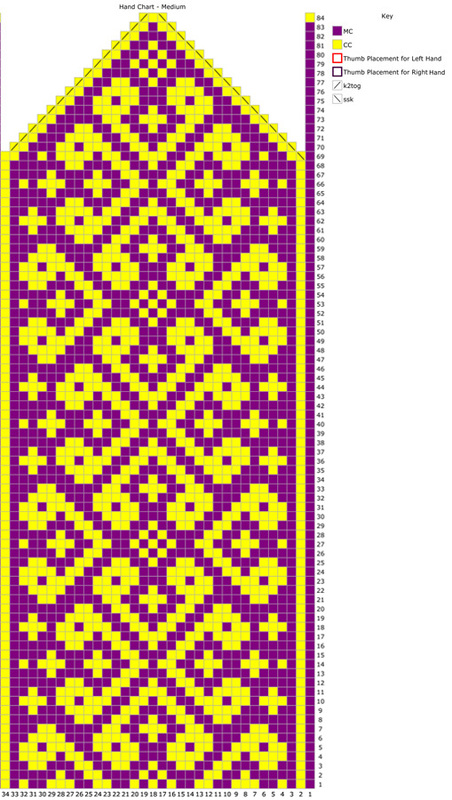 You can then work the joining round by knitting together a stitch from the active needle and the second needle. More info about the Turkish cast-on can be found here. Here's a video demonstrating the Latvian braid. Click below and print each resulting page. Hand charts print over 2 pages -- print both and assemble. With MC and 2.25 mm needle, using long tail CO (or your favorite loose CO), CO 66 sts. Distribute sts across needles as you prefer and join for working in the round. Note to mark start of round. Round 6: [K2tog, yo] around. Joining round: Fold the hem in half, with WS together. Use left needle to pick up the first hem st (from the CO row), and knit the hem st together with the first st of the round. Continue around, until all sts have been worked. Round 1, Size M only: [[K1 MC, k1 CC] 4 times, m1 MC, [k1 CC, k1 MC] 4 times, k1 CC, m1 MC, [k1 CC, k1 MC] 4 times, k1 CC, m1 MC, [k1 CC, k1 MC] 3 times, k1 CC] twice. 72 sts. Round 1, Size L only: [[K1 MC, k1 CC] 3 times, m1 MC, *[k1 CC, k1 MC] 3 times, k1 CC, m1 MC; rep from * twice more, [k1 CC, k1 MC] 3 times, k1 CC] twice. 76 sts. Round 2: [P1 MC, p1 CC] around, always bringing working yarn over the strand just used. Round 3: [P1 MC, p1 CC] around, always bringing working yarn under the strand just used. Note: as you work charts, pay attention to repeat sts required for size Large. Left Mitten, Cuff Round: Work Cuff Side A chart, Work Cuff Side B chart. 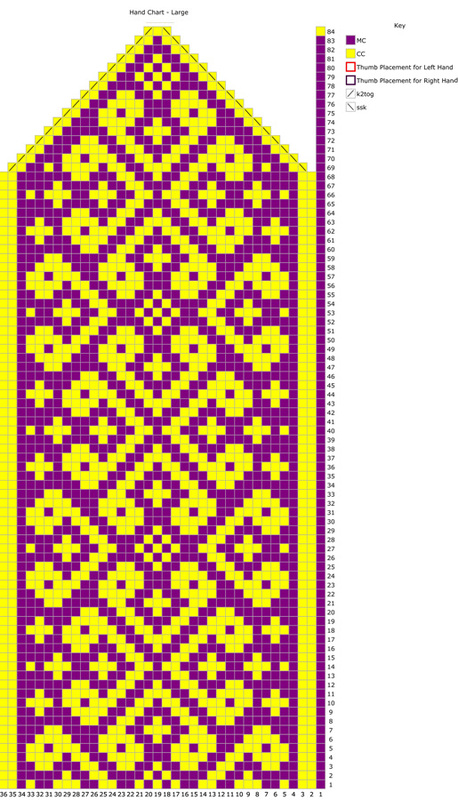 Right Mitten, Cuff Round: Work Cuff Side B chart, Work Cuff Side A chart. Work as set until Cuff charts are complete. Work Rounds 2 & 3 once more. Final round: [K1 MC, k33 CC, k1 MC, k1 CC] twice. Work appropriate size Hand Chart around. Work until 2 rounds of Chart are complete. 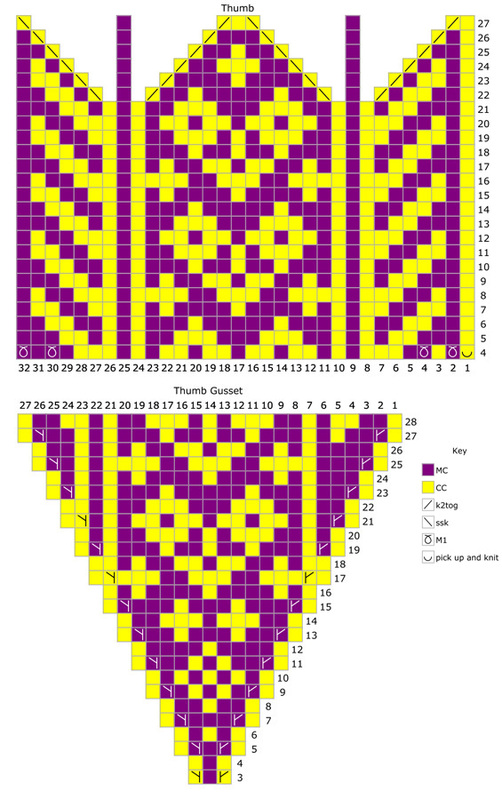 Right Mitten, round 3: Work sts 1-35[1-37] of Hand Chart; place thumb gusset marker, work row 1 of Thumb Chart, pm; work sts 37-72[39 -76] of Hand Chart. 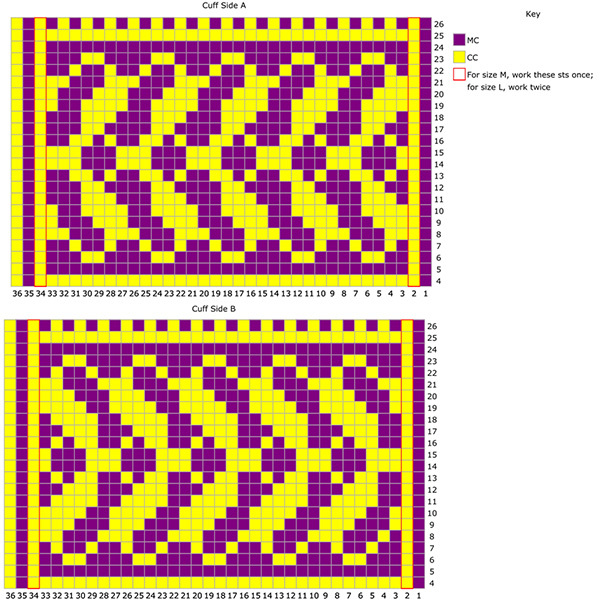 Left Mitten, round 3: Work Hand Chart sts 1-71[1-75] of Hand Chart; pm, work row 1 of Thumb Chart. Next round: Work to thumb gusset marker in pattern as set, work Thumb Gusset chart to next marker, work to end of round in pattern as set. Work as set until Chart Round 28 is complete. 98 sts. Right Mitten, round 29: Work across to thumb gusset marker in pattern as set,, remove marker, slip 27 thumb sts to scrap yarn, CO 1 CC st using backwards loop method. 72 sts. Left Mitten, round 29: Work across to thumb gusset marker in pattern as set, remove marker, slip 27 thumb sts to scrap yarn, CO 1 CC st using backwards loop method, work to end of round in pattern as set. 72 sts. 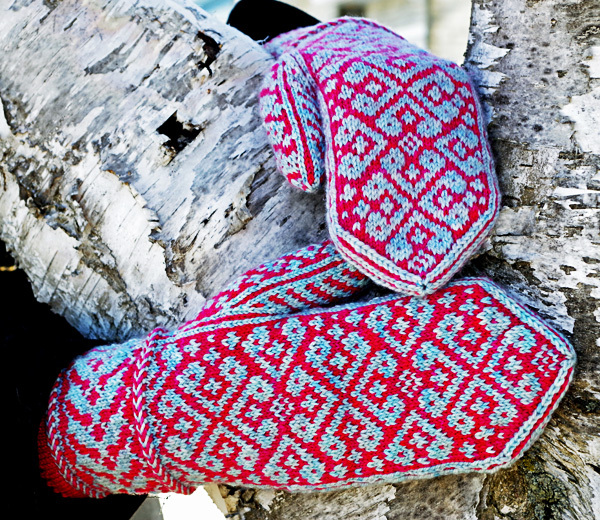 Both Mittens: Continue even in pattern as set until chart is complete. Cut CC and MC, leaving a 6-inch tail. With MC thread yarn tail twice through remaining sts and pull tight to cinch tip closed. Return held thumb sts to a needle. Rejoin yarn at crook of thumb. Pickup and knit the first st with CC over the CC cast on stitch of the hand and work across first row of Thumb chart. 32 sts. Distribute sts across needles as you prefer and join for working in the round. Work Thumb chart until is it complete. Cut CC and MC, leaving a 6-inch tail. With MC thread yarn tail twice through remaining sts and pull tight to cinch tip closed. 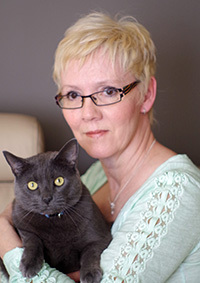 Yvette grew up in Northern Ontario, in a small town called Kapuskasing where the winters were long and the summers short. Her mom taught her how to knit when she was seven years old; she knit mostly Phentex Corn on the Cob slippers back then. She picked up knitting again when she was expecting her first child. Now that her birds have left the nest, she has more time to pursue her new addiction, Fair Isle knitting. She's known as RoseHiver on Ravelry.